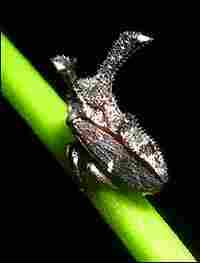 Societies of Sound in the Forest Evidence suggests at least one group of insects, the tiny treehopper, communicates using sound vibrations. Researcher Rex Cocroft has scoured a biologically rich piece of the Amazon in eastern Ecuador to record the sounds of the tiny insect. 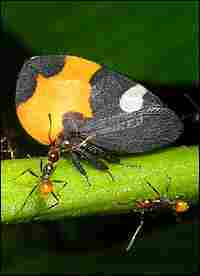 Treehoppers often cluster into groups and exhibit social behavior, like the species Adippe histrio above. Now sensitive microphones can capture the sound vibrations they create -- vibrations that could indicate complex communication skills. A treehopper of the genus Cladonota is almost perfectly camouflaged on a plant stem. Of all the creatures humans encounter on the Earth, surely insects are the most alien. In an evolutionary sense, all creatures share something — but with their segmented body parts, their exoskeletons and their neon colors, what could we possibly have in common with insects? Evidence suggests we share a very powerful trait: Humans and at least one group of insects communicate with one another, using sound. Rex Cocroft, a researcher and professor at the University of Missouri, Columbia, has scoured a biologically rich piece of the Amazon in eastern Ecuador to record the sounds of the tiny treehopper. 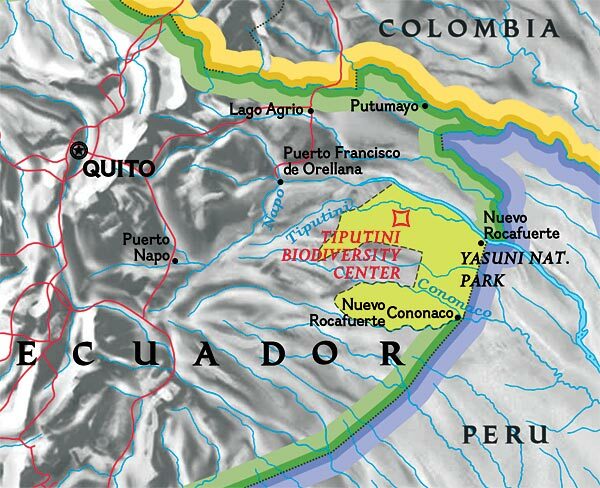 The forest surrounding the Tiputini Biodiversity Station, an eco-research site run by the University of San Francisco in Quito, has a reputation for being home to more different kinds of life than anywhere on Earth. That diversity extends to the treehopper — there are likely hundreds of species of Membracidae clinging to the trees and plants surrounding the station. 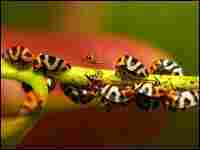 Cocroft studies the evolution of social communication, and says treehoppers are good subjects for study. 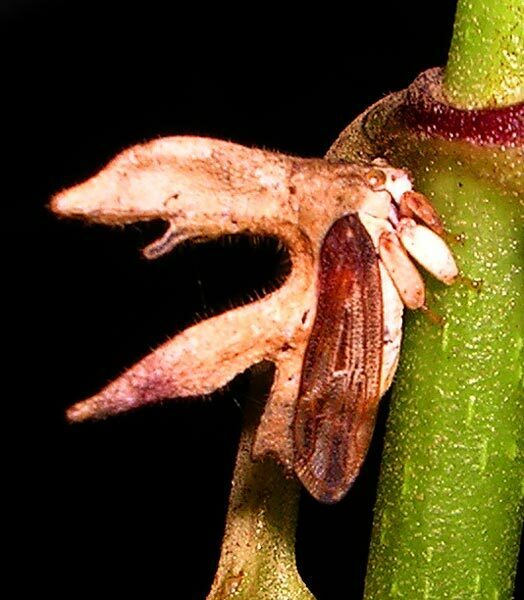 Scientists recently discovered that treehoppers signal to each other by vibrating the plant stems where they live. That discovery means the lives of insects are probably much more complex than previously thought. 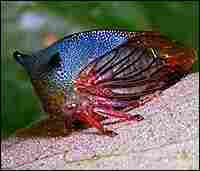 To find a treehopper, think small — some of the creatures are the size of a grain of rice. 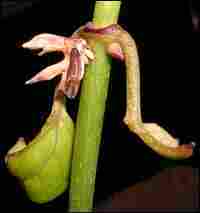 But their various forms and colors can be elegant, even dramatic. One species resembles a tiny castle, others sport brilliant patterns of yellow and orange. But even more dramatic, Cocroft says, is the range of signals between treehoppers. "Their mating signals are often very beautiful, very eerie, or humorous to our ears — a rich, complex set of sounds," he says. "We're very much in the discovery phase, like a linguist or anthropologist studying languages." 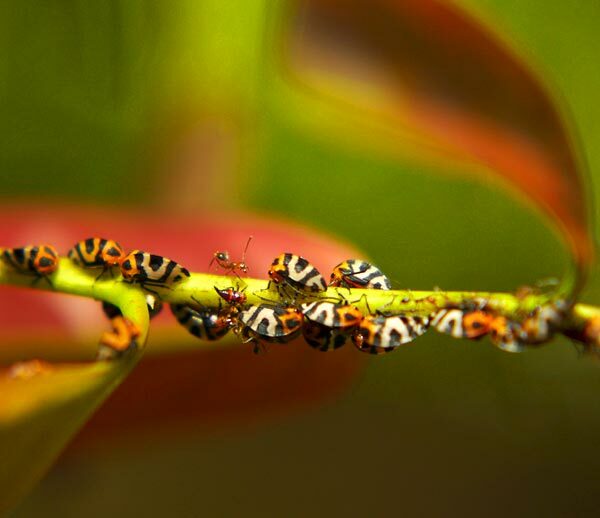 And Cocroft believes that the treehopper vibrations, which he records and amplifies into audible sounds for later study, could contain complex messages, not just simple predator warnings or mating calls. "They have exactly as long a communication history as we do," he says. "People often think of insects as simple, or primitive, or like robots. But they're not. They're very complex — they're just very different from us. They have just as many challenges in their lives, and fabulous, very finely tuned adaptations for dealing with them." Rex Cocroft's research is supported by National Geographic Society's Committee for Research and Exploration, which in more than a century has provided nearly 8,000 research grants worldwide. The committee funds everything from primate research to Mayan archaeology to assessing the biological diversity of the deep ocean. The field recording engineer for this series of stories was NPR's Flawn Williams, and the series was produced by Carolyn Jensen.